A Whole Thing for Her — Ginger writes. I suppose my life is most interesting to me, and yours to you. I am a curious soul, though. I want to know what kind of moisturizer you use and whether you floss before or after you brush your teeth. I want to know what your morning strategy is, that is to say whether you head straight for the shower, the coffee pot, the Bible, or the walking path. I want to know what you read just before bed, and how often you change your sheets. I want to know what you buy at Costco and where you bought your purse. I want to know what your family dinner conversation is like and where you go on date nights. I want to know what's on your kitchen windowsill and if you save bottle caps. And what wine you drink. And what Taylor Swift songs you like. And who you voted for. And if you've been to Tandem lately. I'll forever be interested in knowing who you write letters to. But I am the most curious to know where you grocery shop and and how you cook and what you like to eat. Why this intrigues me so, I do not know. I study people eating food in airports, in restaurants, and in their cars. I love to look. I love to think, Why did they pick peanut M&Ms, and how can they eat those without something to drink? Or, Wow, that person is eating a banana, a real live banana! Knowing how other people eat inspires me in my own eating life. I want to be the banana person, not the peanut M&Ms person. Except when I'm getting gas at QT and I see someone walking out of the store with an orange Fanta and a bag of Combos....then, just for a moment, I dream of being an orange Fanta/Combos person. I can live out my food fantasies through other people, I guess. Or I can be who I am and do what I do, which is to make a game and a challenge of making things match. I find deep satisfaction in planning a week's menu, buying the food, and following through on the plan. I embrace it and enjoy it. My kids know they will find me in the kitchen. I get to work early and stay late. Yet what weight does this hold? Who cares that I cook? Is the work worth it? Are the recipes true friends? Our lives are built bit by bit. Breakfast by breakfast. Book by book. Baby by baby. Bath by bath. We do all these little things that don't matter much, except that this is how we live our lives. We apply moisturizer, floss our teeth, take showers, change our sheets, go to Costco, listen to Taylor Swift, write letters, attempt decent family table talk, cook meals, drink wine, and read before bed. These are the rhythms, the routines, the rituals that define our days. How little we are! How short we last! But to have been here, at this time, on this earth, to be living and breathing and cooking and eating, with these people no less, is most incredible. My week last week didn't strike me as amazing or incredible. It was filled with minutiae, as I assume yours was as well. It can all start to feel mountainous, can't it? Honestly, though, I feel so grateful to be of sound mind and to be able to climb this hill of mine. Rewind about a week and walk a little of my path with me, if you will. I got a haircut and bought a curling iron, and now I see myself differently. I wrote a letter to my friend Ian who is in prison. I missed church because Sailor was sick. I missed the sun because I hardly got outside to sit in it. I cleaned my Berkey and did a red food dye test to check the filter health. I made breakfast cookies, no-bake bars, chocolate oatmeal loaf... in other words, we like desserts for breakfast. I drank tea instead of coffee almost every morning last week. I went to a women's group and a baby shower and saw friends in both places. I stole moments to clean bathrooms, do laundry, and read chapter after chapter of Caddie Woodlawn to the kids. I wrote a blog post about the election and didn't post it. I went for morning walks and did memory work and made dinners and made water kefir. I finished reading Dimestore by Lee Smith. 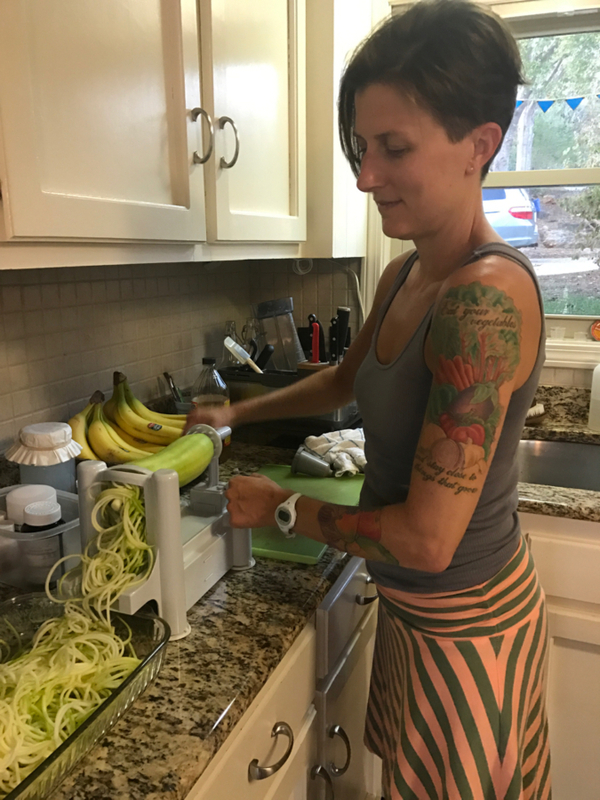 I used a spiralizer for the first time. I copied quotes from Writing Down the Bones and wished I was writing down the bones more than I am. I felt angst about writing, and angst about not writing. And here I am, at the start of a new week, trying to interest you with what interests me. If that didn't do, how about if I occasionally post some recipes and see if I can help you make things match? 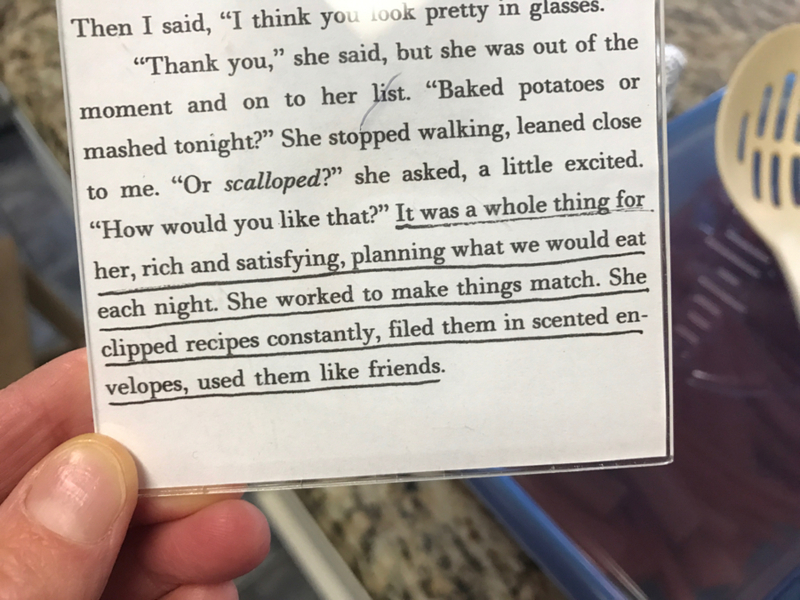 Sharing recipes with friends is one of my favorite things to do, and I do it all the time in real life and in letters. I used to do it on my old blog and had not planned to do it here on this blog. But I have reconsidered, and now we can just pretend each time I post a recipe that I'm writing you a letter and enclosing this very recipe just for you. How 'bout that? Really, are our daily lives built any more consistently and meaningfully than with the recipes we make and the recipes we share? "It was a whole thing for her..." being a writer who loves to know how other people eat and who hopes they might care just a tiny bit about how she eats.